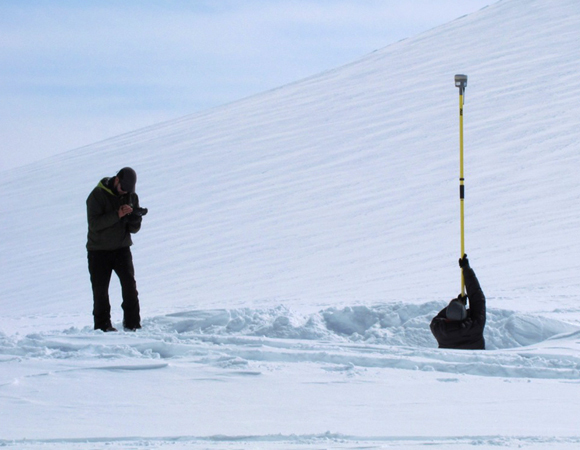 The main goal of this collaborative Dartmouth-University of Maine-University of New Hampshire project is to reconstruct the history of precipitation and atmospheric circulation in Alaska during the last thousand years using ice core records of snow accumulation. 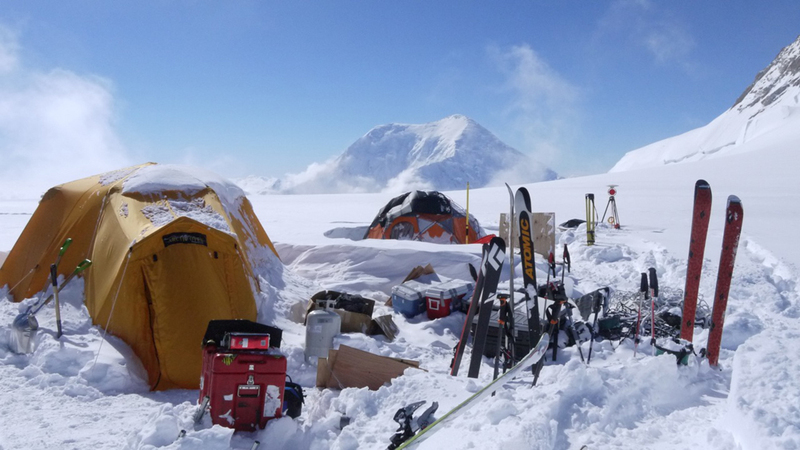 The project centers around two new ice cores collected to bedrock (208 m) from the Mount Hunter Plateau in the Alaska Range of Denali National Park in May-June 2013. These cores will be analyzed for chemical concentrations and stable water isotopes to reconstruct past snow accumulation. These new records will be combined with an existing array of ice cores collected from the North Pacific region to map changes in the spatial patterns of precipitation through time. Because atmospheric circulation patterns such as El Niño and the Pacific Decadal Oscillation have specific precipitation fingerprints, this array of ice cores will provide a record of how these larger-scale climate systems have varied during the last thousand years. 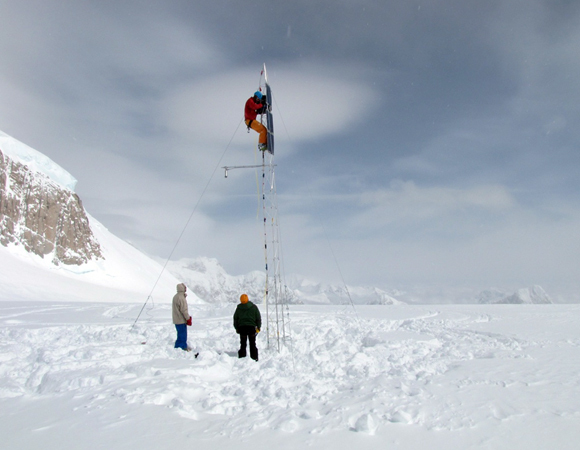 Accompanying annual snow profile pits and meteorological measurements will help with ice core interpretation. UNAVCO has been supporting this project with GPS equipment and terrestrial LiDAR scanning (TLS) over the past several years. 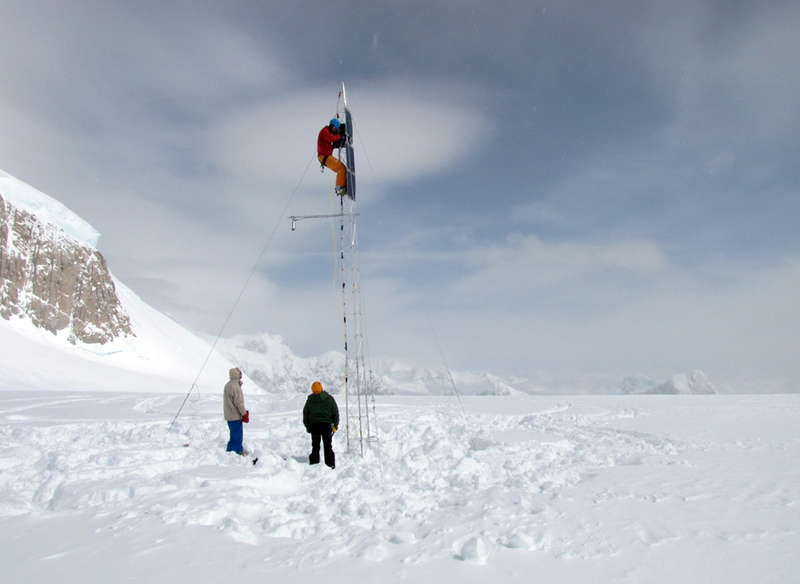 In previous years, UNAVCO supplied the field team with GPS equipment to measure the locations of sample sites, and snow ablations stakes to precisely measure the movement of the glacier at the study site. 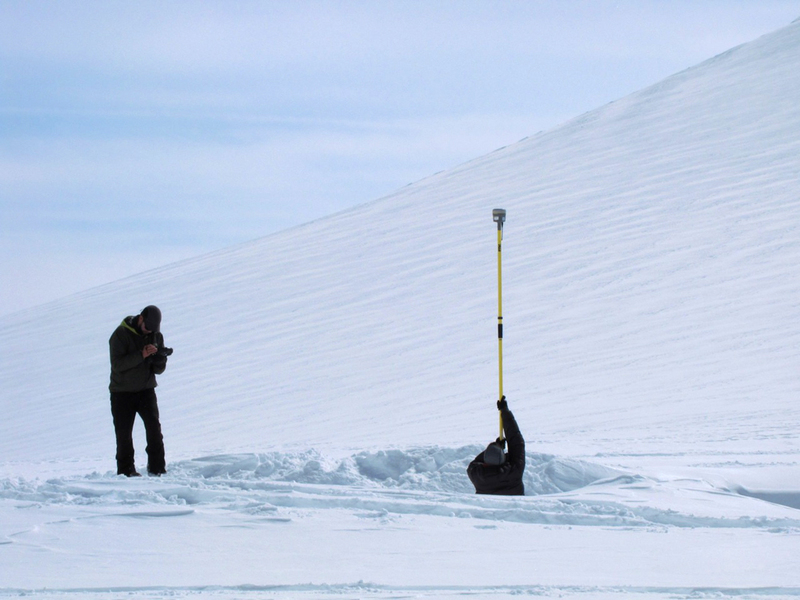 The high-precision GPS measurements were also used to spatially correlate ground penetrating radar profiles of the glacier. 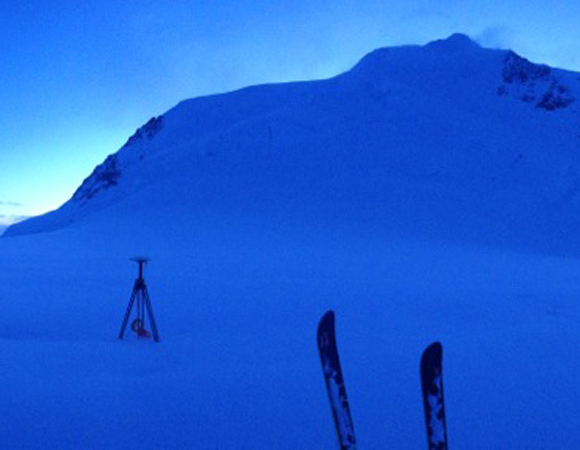 Snow accumulation from year to year is also measured with GPS. 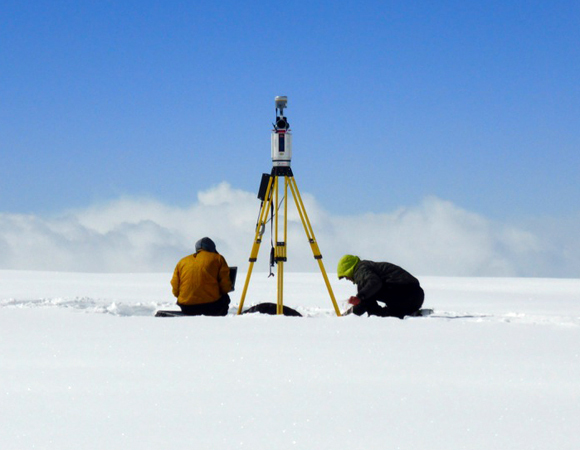 During the summer 2014 field season, UNAVCO provided TLS equipment and engineering support for a ground-based LiDAR survey of Mount Hunter Plateau. The TLS survey will provide a high-resolution surface topography map for input into glacier-dynamic models. Glacier flow models are used to determine how the glacier is deforming, which is important in interpreting the ice core. There were many significant logistical and weather challenges to address when working at high elevations in the Alaska range. 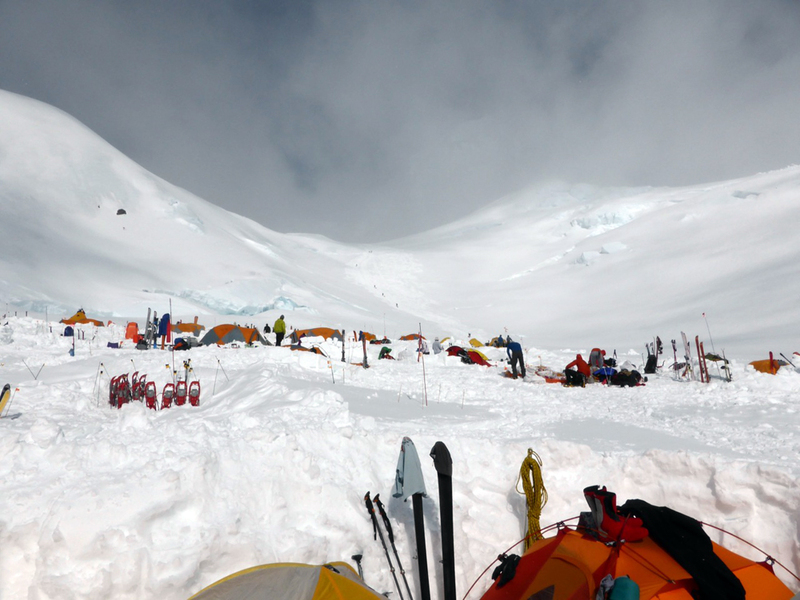 The team was initially delayed for five days arriving on the Kahiltna Glacier due to poor weather preventing the transport of equipment and personnel by a ski-equipped DH Otter piloted by Paul Roderick of Talkeetna Air Taxi. 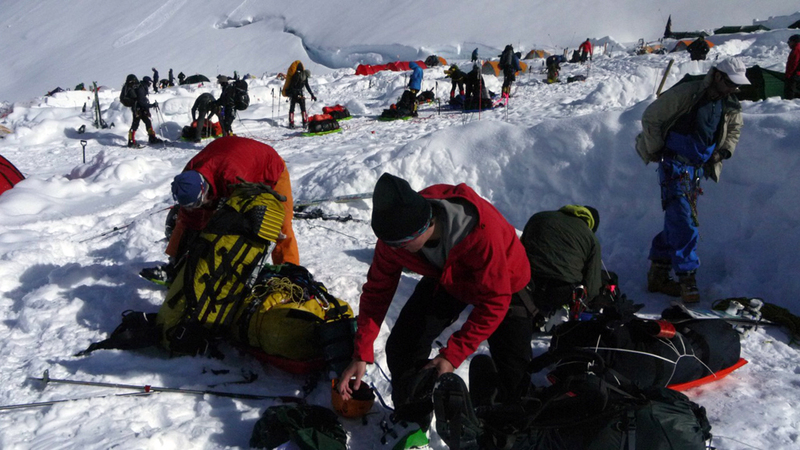 In order to safely acclimatize to the high elevation at the study site, the research team was required to spend three days at the 11,000-foot camp on Denali’s West Buttress climbing route. 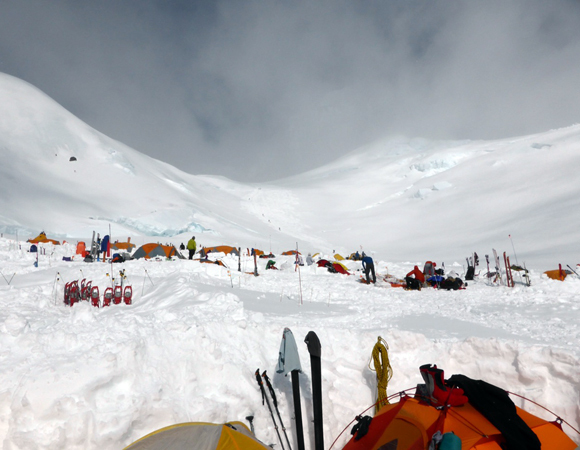 After this initial climb and decent, the team was ready for helicopter transport to the study site. 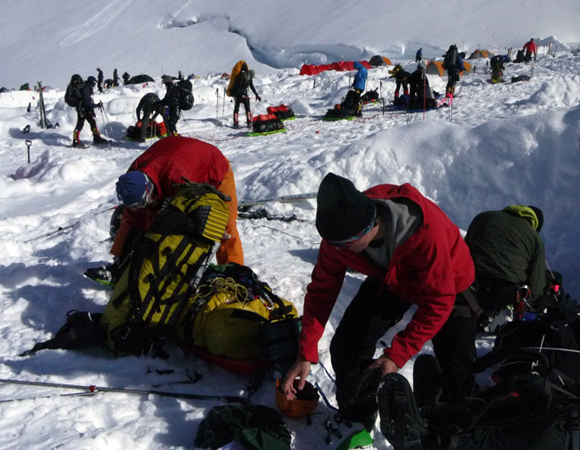 The main logistical challenge was transporting food, fuel, science equipment, and survival gear to an isolated high elevation glacier. 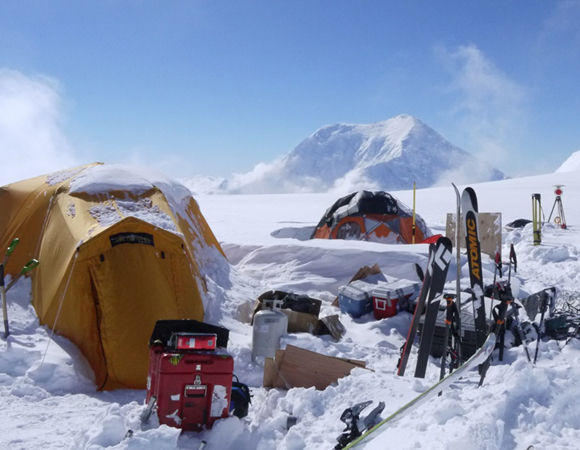 This challenge was overcome by working with the Denali National Park Service, who provided helicopter transportation from the Kahiltna Glacier base camp to the study site high on Mount Hunter. The NPS Eurocopter AS350 P3, piloted by Andy Hermansky, required multiple sling loads and passenger trips to transport the research team and equipment to the study site at 13,000 ft. Fortunately, a short break in weather, and perfect planning by the NPS rangers allowed for just enough time to transport the team and equipment to the study site before another storm arrived. 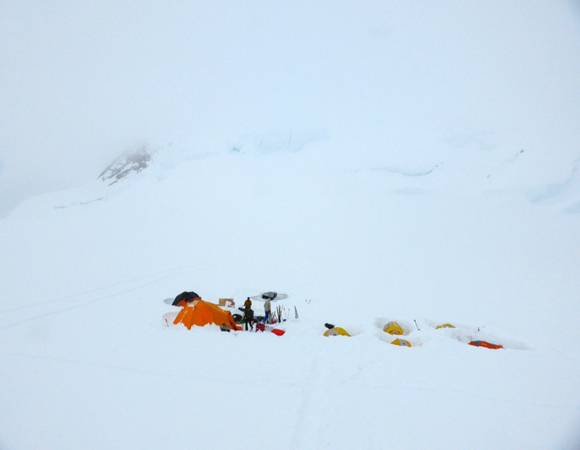 Field work continued on the weather station and snow sampling pits at the research site during low visibility and deep snow. However, clear and calm weather is necessary to acquire the TLS survey data needed for the project. 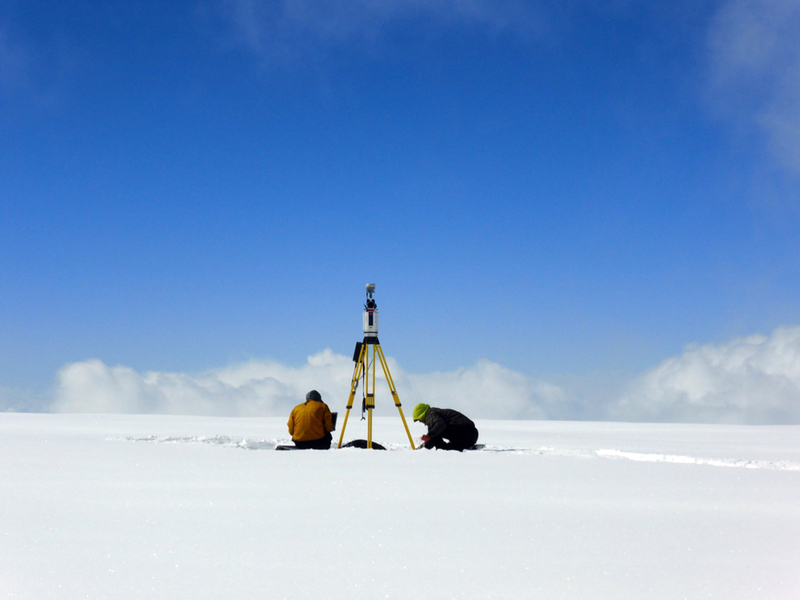 Finally, a brief break in the storm allowed for a short survey and a few days later another break in a storm permitted a complete survey of the glacier surface around the ice core study site. 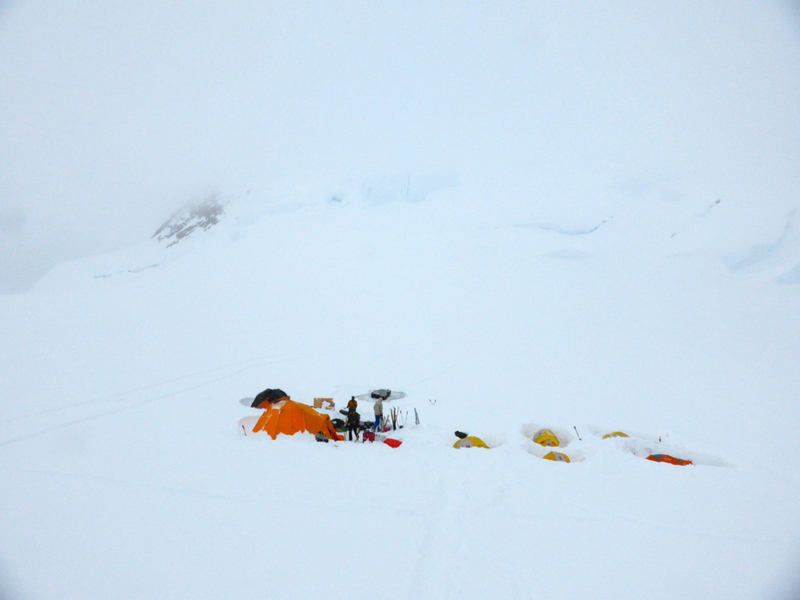 The team was delayed once again by a storm for five days returning to the Kahiltna glacier to pack up samples and equipment for fixed wing transport back to Talkeetna. Despite the continuous stormy periods, the research team was able to achieve all the goals for the season and plan to return next year to finish data collection for this multi-year study.